Dal Tadka, a North Indian dal recipe, is a Dhaba style favorite food of mine. 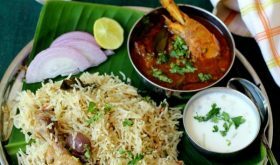 I have a lot of warm childhood memories associated with Dhaba style food with all its smoky flavors. On many a road trip, our standard mid day vegetarian meal consisted of hot pulka, dal tadka, aloo gobi sabzi, paneer curry, dahi, lassi and salad. We always try to find an authentic Punjabi dhaba (typically run by a Punjabi) present along the highway route where the food is usually cooked over wood fire. 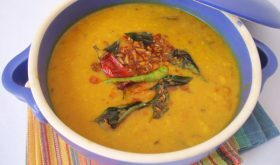 I have numerous dal recipes on my blog and wonder why it took me so long to post the recipe of Dal Tadka which happens to be a favorite of mine. Dal Tadka aka Tadka Dal or Dal Tarka is a healthy, hearty, beautifully textured, smoky flavored Indian dal dish that is revered by many a Dhaba food connoisseur. The aroma that emanates the home while preparing the tadka for the dal dish is something one needs to experience as I cannot explain in words the sizzle and mingle of Indian spices in hot oil or desi ghee. Truly intoxicating. I have prepared Dal Tadka using three types of Indian lentils – tur dal (red gram), chana dal (Bengal gram) and moong dal (yellow dal). You can use just tur dal or any two lentils like masoor dal or yellow moong dal, if you do not have all the three types of lentils on hand. I have used desi ghee (clarified butter) for tempering which gives a rustic flavor to the dal. You can use oil for a vegan version which will taste just as good. 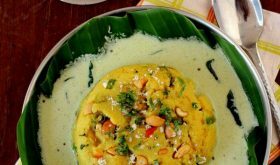 Authentic Dal Tadka recipe does not call for the use of curry leaves but I like the flavor of curry leaves and hence I threw in a few leaves in the tempering. Dal Tadka goes best with hot pulkas, chapati, naan and jeera pulao. 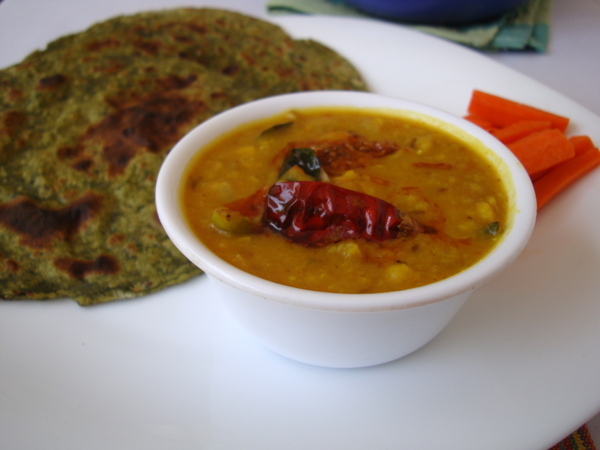 I served Dal Tadka with Palak Lachcha Paratha which made for a fantastic combination. In a pressure cooker, add 2 cups of water and add the three lentils/dals, green chilies, ginger, hing and turmeric pwd and pressure cook upto 3 whistles. If cooking over stove top, cook till the dals are almost cooked. Mash the dals lightly. Heat ghee in a heavy bottomed vessel, add crushed coriander seeds and stir fry for few secs. Add the chopped tomato and saute for 4 mts. Add the pressure cooked dal along with salt and mix. Add a large cup of water and cook on slow to medium flame for 10 mts without lid or till you get the consistency of your choice. Remove onto a serving bowl and keep aside while you prepare the tempering. 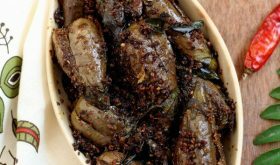 Heat ghee in a small pan, add the cumin seeds and as they splutter, add hing, red chilies, green chili, red chili powder and curry leaves and saute for a few secs. Turn off heat and pour this over the dal. 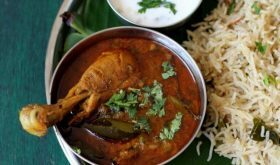 Serve with rotis or jeera pulao or white rice. A variation - saute a chopped onion before sauteing the tomatoes. Amchur powder and garam masala powder can be added to the tempering. Add a pinch of each. 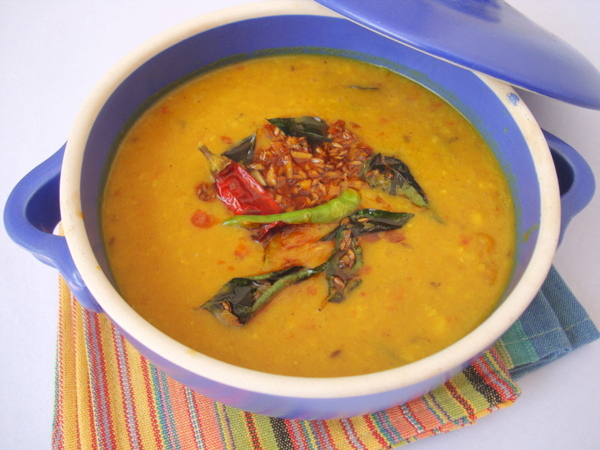 Dal Tadka can be prepared using just Tur dal OR Yellow moong dal. There are numerous version of Dal Tadka. The one above is a regular in our home. Curry leaves are an optional ingredient. By Sailu Published: May 22, 2012 Dal Tadka,a North Indian dal recipe,is a Dhaba style favorite food of mine.Hot pulka and dal tadka is our standard vegetarian meal on many of our road trips. very simple dish. but first i will try this. You are a true artist. Such a simple recipe, but you make it wow!!. Wow, how nicely you’ve made it look so special. Its a staple food for us north Indian’s, just that we would replace the curry leaves with bay leaf usually. Nice presentation and pictures are very appetizing! I normally follow the same recipe as yours and add Amchur powder for that tangy flavor! Daal Tadka is definitely a fave in my house too. nicely done! 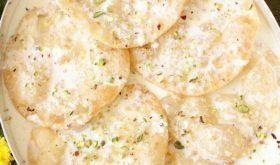 very simple and tasty recipe i like to cook this in my kitchen…. Thanks for the recipe. It turned out really nice except I think I burnt the tadka. How do I change the cooking time if I have no pressure cooker??? Thank you!! !